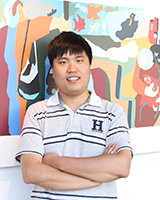 Yuliang’s research is focused on developing novel computational approaches to integrate large multi-omic datasets (transcriptomics, epigenomics, metabolomics etc.) and biological networks to understand the interconnections between metabolism and epigenetics in developmental processes. Pluripotent stem cell differentiation and tissue development are often accompanied by significant metabolic shifts. It is increasingly recognized that metabolic states are not merely the byproduct of cellular signaling, but can actively influence cell fate decision. In particular, cellular epigenetic states (histone and DNA methylation, histone acetylation) and intermediary metabolism are interconnected by key metabolites, such as S-Adenosyl methionine, α-ketoglutarate, acetyl-CoA, which are also substrate for epigenetic modifying reactions. My research aims to understand the how metabolic network state influences stem cell differentiation and tissue development via its effects on epigenetic modifications. This research can lead to efficient metabolic approaches (changing medium culture, inhibiting or activating a metabolic enzyme) to manipulate cell fates for regenerative medicine applications.